Mountain Bike Tyre rolling resistance has always been a debatable issue. What really affects rolling resistance, wide vs narrow, low vs high pressures and what type of tread pattern. Everybody has their own opinion and very little if any of it is based on actual scientific testing. Most rolling resistance tests are done on tarmac with skinny wheels, so how does this compare to the varied terrain that mountain bikes cross. The answer is that it does not compare at all. 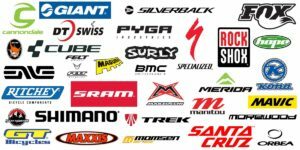 Hard and skinny is the rule for low rolling resistance on tarmac with road bikes, but mountain bikes have their own rules. Peter Nilges did his graduate dissertation at the German College of Physical Education, Cologne, and researched the subject of rolling resistance. The mountain bike tyre rolling resistance testing article was published in the mountainbike-magazin.de. Peter measured rolling resistance under varying conditions. 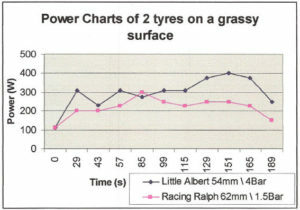 Three different tyres (Schwalbe’s Fast Fred, Racing Ralph and Albert Brothers) in three different widths and at four different pressure levels (1.5, 2.0, 3.0 and 4.0 bar – c. 21, 28, 43 and 57 p.s.i.). The test course is an uphill grade, 460 m in length, with side by side road, gravel and a meadow surfaces. Nearly 350 test rides totalling a distance of 150 kilometres. The Albert Brothers, with their coarse tread pattern, were the hardest to roll on all surfaces. Surprisingly enough studded Racing Ralph’s fine pattern rolls easier on-road than Fast Fred, a semi-slick, while positions are reversed off-road. The explanation is likely to be found in the structure of the tread pattern and the carcasses’ flexibility (Evolution Design). 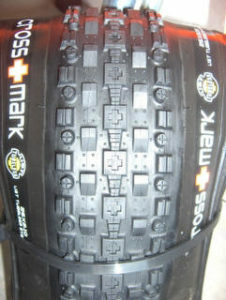 Racing Ralph’s studs protrude significantly further but in the tread area are spaced more closely so that they nearly form an uninterrupted centre ridge. This lets the tyre roll more smoothly on firm ground, as opposed to continually descending into the gaps between individual studs, only to have to rise again. Off-road on the other hand flexibility has a more significant influence than the tread pattern. The thinner rubber layer on the carcass of a semi-slick can adapt more easily to an uneven surface. The test covered widths from 2″ to 2.4″, or 50 to 62 mm. While on-road there is no marked difference between a narrow and a wide tyre, off-road the wide tyre is proven to roll more easily! The rougher the ground, the greater the advantage, as the data obtained on grass proves. The wider tyre’s contact area is wider, but shorter. Moreover wider tyres have larger diameters, and again that improves rolling. 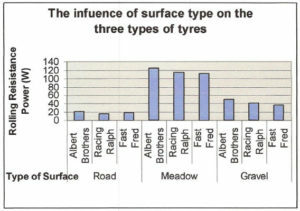 Off-road rolling resistance decreases significantly with increased tyre width. For instance on grass the wide mountain bike tyres required 15.41 W less rolling resistance power than their narrower equivalents. As soon as you leave the road, reducing tyre pressures does not just leave rolling resistance more or less unaffected, as can be heard here and there, but actually reduces rolling resistance! This is true even on level paths of fine gravel, but the rougher the ground, the greater the effect, as the grassy ground shows. Reducing tyre pressure from 4 to 1.5 bar (57 to 21 p.s.i.) can save an averaged 20 W! The main reason for this is the unevenness of the ground. 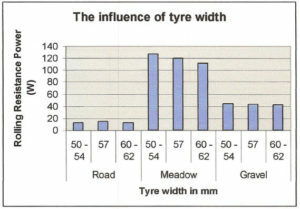 A tyre with less inflation can adapt to unevenness more easily. The total system needs to be lifted to a lesser degree and less frequently. Resistance is reduced, less power is required. 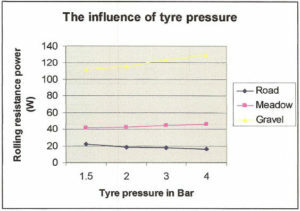 Off-road a reduction of tyre pressure reduces rolling resistance. In a meadow for instance going back from 4.0 to 1.5 bar (57 to 21 p.s.i.) 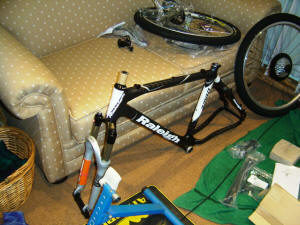 can save remarkable 18 Watts of power. On an identical course and at exactly the same speed, the widest of the tyres tested here at 1.5 bar (21 p.s.i.) requires a solid 50 W less power than a narrow tyre at 4.0 bar (57 p.s.i.). Anyone who wants to ride really fast off-road needs to decrease tyre pressure. The rougher the ground, the more pronounced the effect. In addition traction and comfort increase, too. Due to their thin and flexible structure, semi-slicks offer the best start-up values for minimizing rolling resistance off-road. With a reduction in pressure, however, the risk of a flat increases. And traction with the semi-slick is limited. So the answer to the question of which width is best off-road clearly reads ‘fat tyre’ both for superior traction and snake bite prevention. For cross country races and marathons involving only a small percentage of tarmac a wide tyre with low pressure is recommended. The most overestimated aspect here is the frequently criticized extra weight of the wider tyre. To accelerate a pair of tyres with an extra weight of 500 g from 0 to 25 kph in 4 seconds requires an additional 4.2 W power. On the other hand the wider tyre on a grassy surface saves you 15.5 W against a narrower specimen, and this at the low speed of 9.5 kph. Moreover the rolling resistance reduction has a continuous effect while lighter weight is only of relevance during acceleration.